In honour of Archives Awareness Week we are once again opening the vaults to share some of our favorite pictures. Back in the day, the Guiding Law included “A Guide is a friend to animals.” In the same way that we can be helpful to animals, they can bring a little bit of cuteness and laughter to our lives. With this winter dragging on and on and on in many parts of Canada, we thought it would be a good time to open the vaults and bring out some animal-induced happiness. Lone Guide with dog c. 1960. Lone Guides often used mail to keep in touch with their Leader and other Lone Guides. The women of the first Canadian Council of Girl Guides of Canada – and a cat – sit on the steps of Casa Loma, the home of our first Chief Commissioner, Lady Mary Pellatt c.1918. Many pictures from Casa Loma feature a dog or cat. In the earliest years of Guiding, a unit would often approach a local farmer for permission to camp in their field. The farmer’s daughter Joan took some Guides for a ride on her pony, Lickity Cut. Dog in a horseshoe from the album ‘Canadian Guiding prior to 1934’. The uniforms in this picture lead us to believe that this is probably from the first 10 years of Guiding in Canada. 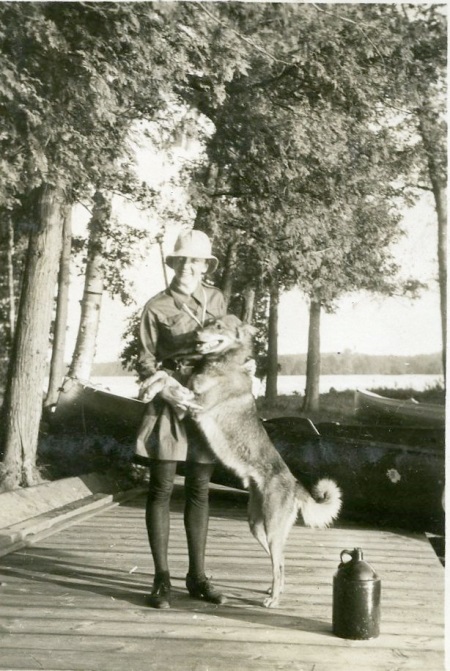 Opening the Vaults is a blog series featuring photos and records from the Girl Guides of Canada archives. See some of the previous posts from this series: Cookie Selling; Embarrassing Moments; Retro Camp Pics; The Maple Leaf Forever. This entry was posted in Girls' Guides and tagged Archives Awareness Week, Girl Guide archives, Girl Guide history, Girl Guides and animals, Opening the Vaults. Bookmark the permalink.